The 1956 United States presidential election in New York took place on November 6, 1956. All contemporary 48 states were part of the 1956 United States presidential election. New York voters chose forty five electors to the Electoral College, which selected the president and vice president. New York was won by incumbent Republican President Dwight D. Eisenhower, who was running against former Democratic Governor of Illinois Adlai Stevenson. 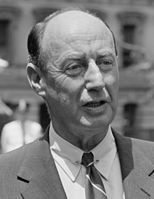 Eisenhower ran with incumbent Vice President Richard Nixon, and Stevenson ran with Tennessee Senator, and principal opponent during the 1956 Democratic Primaries, Estes Kefauver. 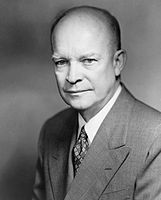 Eisenhower received 61.19% of the vote to Stevenson's 38.78%, a margin of 22.41%. New York weighed in for this election as 4% more Republican than the national average. This election was very much of a re-match from the previous presidential election four years earlier, which featured approximately the same major candidates. The presidential election of 1956 was a very partisan election for New York, with 99.8% of the electorate voting for either the Democratic Party or the Republican Party. The widely popular Eisenhower took every county in the State of New York outside of New York City, dominating upstate by landslide margins and also sweeping suburban areas around NYC. Stevenson narrowly won New York City overall by carrying the boroughs of Manhattan, Brooklyn, and the Bronx, while Eisenhower won Queens and Staten Island. Eisenhower won the election in New York by a 22-point sweep-out landslide. The presidential election of 1956 is one of the final years in American politics with a Civil War Democratic stronghold in the Deep South. This was also one of the first elections in New York (and nationally) where most campaign finance went to television ads. Stevenson campaigned on a platform of expansion of government social programs founded under former President Franklin D. Roosevelt, scaling back the Cold War with the Soviet Union, and ending the U.S. draft, seeking an 'all volunteer armed forces.' While Stevenson's policies were largely popular with many people living in the United States at the time, Eisenhower's post World War II star-power and strong stance against peace-talks with the Soviet Union, won him a landslide victory across the United States, including in New York. Eisenhower had first won election to the White House in 1952 as a war hero, a political outsider, and a moderate Republican who pledged to protect and support popular New Deal Democratic policies, finally ending 20 years of Democratic control of the White House. Once in office, Eisenhower governed as a moderate progressive, approving infrastructure spending projects like the Interstate Highway System and supporting high tax rates on the rich, as well as taking a progressive stand on issues related to the Civil Rights Movement. Thus Eisenhower was able to win over many more normally Democratic-leaning liberal and moderate voters in the Northeast than he already had in 1952, and thus every Northeastern state swung in his favor in 1956, including New York. 1956 was the last election in which a Republican presidential candidate took more than 60% of the vote in New York State, as well as the last election in which New York State was more Republican than the national average. ^ "Dave Leip's Atlas of U.S. Presidential Elections". Uselectionatlas.org. Retrieved 2013-07-14. This page was last edited on 16 January 2019, at 14:50 (UTC).